Angiogenesis is the physiological process through which new blood vessels form from pre-existing vessels, formed in the earlier stage of vasculogenesis. Angiogenesis continues the growth of the vasculature by processes of sprouting and splitting. Vasculogenesis is the embryonic formation of endothelial cells from mesoderm cell precursors, and from neovascularization, although discussions are not always precise (especially in older texts). The first vessels in the developing embryo form through vasculogenesis, after which angiogenesis is responsible for most, if not all, blood vessel growth during development and in disease. Angiogenesis is a normal and vital process in growth and development, as well as in wound healing and in the formation of granulation tissue. However, it is also a fundamental step in the transition of tumors from a benign state to a malignant one, leading to the use of angiogenesis inhibitors in the treatment of cancer. The essential role of angiogenesis in tumor growth was first proposed in 1971 by Judah Folkman, who described tumors as "hot and bloody," illustrating that, at least for many tumor types, flush perfusion and even hyperemia are characteristic. Angiogenesis may be a target for combating diseases characterized by either poor vascularisation or abnormal vasculature E.g Heart Disease sufferers. Application of specific compounds that may inhibit or induce the creation of new blood vessels in the body may help combat such diseases. The presence of blood vessels where there should be none may affect the mechanical properties of a tissue, increasing the likelihood of failure. The absence of blood vessels in a repairing or otherwise metabolically active tissue may inhibit repair or other essential functions. Several diseases, such as ischemic chronic wounds, are the result of failure or insufficient blood vessel formation and may be treated by a local expansion of blood vessels, thus bringing new nutrients to the site, facilitating repair. Other diseases, such as age-related macular degeneration, may be created by a local expansion of blood vessels, interfering with normal physiological processes. The modern clinical application of the principle of angiogenesis can be divided into two main areas: anti-angiogenic therapies, which angiogenic research began with, and pro-angiogenic therapies. Whereas anti-angiogenic therapies are being employed to fight cancer and malignancies, which require an abundance of oxygen and nutrients to proliferate, pro-angiogenic therapies are being explored as options to treat cardiovascular diseases, the number one cause of death in the Western world. One of the first applications of pro-angiogenic methods in humans was a German trial using fibroblast growth factor 1 (FGF-1) for the treatment of coronary artery disease. Tumors induce blood vessel growth (angiogenesis) by secreting various growth factors (e.g. VEGF) and proteins. 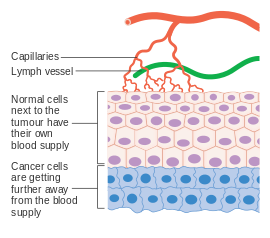 Growth factors such as bFGF and VEGF can induce capillary growth into the tumor, which some researchers suspect supply required nutrients, allowing for tumor expansion. Unlike normal blood vessels, tumor blood vessels are dilated with an irregular shape. Other clinicians believe angiogenesis really serves as a waste pathway, taking away the biological end products secreted by rapidly dividing cancer cells. In either case, angiogenesis is a necessary and required step for transition from a small harmless cluster of cells, often said to be about the size of the metal ball at the end of a ball-point pen, to a large tumor. Angiogenesis is also required for the spread of a tumor, or metastasis. Single cancer cells can break away from an established solid tumor, enter the blood vessel, and be carried to a distant site, where they can implant and begin the growth of a secondary tumor. Evidence now suggests the blood vessel in a given solid tumor may, in fact, be mosaic vessels, composed of endothelial cells and tumor cells. This mosaicity allows for substantial shedding of tumor cells into the vasculature, possibly contributing to the appearance of circulating tumor cells in the peripheral blood of patients with malignancies. The subsequent growth of such metastases will also require a supply of nutrients and oxygen and a waste disposal pathway. Endothelial cells have long been considered genetically more stable than cancer cells. This genomic stability confers an advantage to targeting endothelial cells using antiangiogenic therapy, compared to chemotherapy directed at cancer cells, which rapidly mutate and acquire 'drug resistance' to treatment. For this reason, endothelial cells are thought to be an ideal target for therapies directed against them. The mechanism of blood vessel formation by angiogenesis is initiated by the spontaneous dividing of tumor cells due to a mutation. Angiogenic stimulators are then released by the tumor cells. These then travel to already established, nearby blood vessels and activates their endothelial cell receptors. This induces a release of proteolytic enzymes from the vasculature. These enzymes target a particular point on the blood vessel and cause a pore to form. This is the point where the new blood vessel will grow from. The reason tumour cells need a blood supply is because they cannot grow any more than 2-3 millimeters in diameter without an established blood supply which is equivalent to about 50-100 cells. Angiogenesis of vessles from the host body into an implanted tissue engineered constructs is essential. Successful intergration is often dependent on thorough vascularisation of the construct as it provides oxygen and nutrients and prevents necrosis in the central areas of the implant. PDGF has been shown to stabilize vascularisation in collagen-glycosaminoglycan scaffolds. Quantifying vasculature parameters such as microvascular density has various complications due to preferential staining or limited representation of tissues by histological sections. Recent research has shown complete 3D reconstruction of tumor vascular structure and quantification of vessel structures in whole tumors in animal models. ^ a b Angiogenesis insights from a systematic overview. New York: Nova Science. 2013. ISBN 978-1-62618-114-4. ^ Birbrair A, Zhang T, Wang ZM, Messi ML, Mintz A, Delbono O (January 2015). "Pericytes at the intersection between tissue regeneration and pathology". Clinical Science. 128 (2): 81–93. doi:10.1042/CS20140278. PMC 4200531. PMID 25236972. ^ Birbrair A, Zhang T, Wang ZM, Messi ML, Olson JD, Mintz A, Delbono O (July 2014). "Type-2 pericytes participate in normal and tumoral angiogenesis". American Journal of Physiology. Cell Physiology. 307 (1): C25–38. doi:10.1152/ajpcell.00084.2014. PMC 4080181. PMID 24788248. ^ "Lymphatic vasculature development" (PDF). www.columbia.edu. Retrieved 17 December 2018. ^ Risau W, Flamme I (1995). "Vasculogenesis". Annual Review of Cell and Developmental Biology. 11: 73–91. doi:10.1146/annurev.cb.11.110195.000445. PMID 8689573. ^ Flamme I, Frölich T, Risau W (November 1997). "Molecular mechanisms of vasculogenesis and embryonic angiogenesis". Journal of Cellular Physiology. 173 (2): 206–10. doi:10.1002/(SICI)1097-4652(199711)173:2<206::AID-JCP22>3.0.CO;2-C. PMID 9365523. ^ Burri PH, Hlushchuk R, Djonov V (November 2004). "Intussusceptive angiogenesis: its emergence, its characteristics, and its significance". Developmental Dynamics. 231 (3): 474–88. doi:10.1002/dvdy.20184. PMID 15376313. ^ a b c d e Prior BM, Yang HT, Terjung RL (September 2004). "What makes vessels grow with exercise training?". Journal of Applied Physiology. 97 (3): 1119–28. doi:10.1152/japplphysiol.00035.2004. PMID 15333630. ^ Perhaps an inhibitor of angiogenesis: Sheppard D (October 2002). "Endothelial integrins and angiogenesis: not so simple anymore". The Journal of Clinical Investigation. 110 (7): 913–4. doi:10.1172/JCI16713. PMC 151161. PMID 12370267. ^ a b c Mecollari V, Nieuwenhuis B, Verhaagen J (2014). "A perspective on the role of class III semaphorin signaling in central nervous system trauma". Frontiers in Cellular Neuroscience. 8: 328. doi:10.3389/fncel.2014.00328. PMC 4209881. PMID 25386118. ^ Ornitz DM, Itoh N (2001). "Fibroblast growth factors". Genome Biology. 2 (3): REVIEWS3005. doi:10.1186/gb-2001-2-3-reviews3005. PMC 138918. PMID 11276432. ^ Blaber M, DiSalvo J, Thomas KA (February 1996). "X-ray crystal structure of human acidic fibroblast growth factor". Biochemistry. 35 (7): 2086–94. CiteSeerX 10.1.1.660.7607. doi:10.1021/bi9521755. PMID 8652550. ^ a b c Stegmann TJ (December 1998). "FGF-1: a human growth factor in the induction of neoangiogenesis". Expert Opinion on Investigational Drugs. 7 (12): 2011–5. doi:10.1517/13543784.7.12.2011. PMID 15991943. ^ Khurana R, Simons M (April 2003). "Insights from angiogenesis trials using fibroblast growth factor for advanced arteriosclerotic disease". Trends in Cardiovascular Medicine. 13 (3): 116–22. doi:10.1016/S1050-1738(02)00259-1. PMID 12691676. ^ Goto F, Goto K, Weindel K, Folkman J (November 1993). "Synergistic effects of vascular endothelial growth factor and basic fibroblast growth factor on the proliferation and cord formation of bovine capillary endothelial cells within collagen gels". Laboratory Investigation; A Journal of Technical Methods and Pathology. 69 (5): 508–17. PMID 8246443. ^ Ding YH, Luan XD, Li J, Rafols JA, Guthinkonda M, Diaz FG, Ding Y (December 2004). "Exercise-induced overexpression of angiogenic factors and reduction of ischemia/reperfusion injury in stroke". Current Neurovascular Research. 1 (5): 411–20. doi:10.2174/1567202043361875. PMID 16181089. Archived from the original on April 19, 2012. ^ Gavin TP, Robinson CB, Yeager RC, England JA, Nifong LW, Hickner RC (January 2004). "Angiogenic growth factor response to acute systemic exercise in human skeletal muscle". Journal of Applied Physiology. 96 (1): 19–24. doi:10.1152/japplphysiol.00748.2003. PMID 12949011. ^ Kraus RM, Stallings HW, Yeager RC, Gavin TP (April 2004). "Circulating plasma VEGF response to exercise in sedentary and endurance-trained men". Journal of Applied Physiology. 96 (4): 1445–50. doi:10.1152/japplphysiol.01031.2003. PMID 14660505. ^ Lloyd PG, Prior BM, Yang HT, Terjung RL (May 2003). "Angiogenic growth factor expression in rat skeletal muscle in response to exercise training". American Journal of Physiology. Heart and Circulatory Physiology. 284 (5): H1668–78. doi:10.1152/ajpheart.00743.2002. PMID 12543634. ^ Thurston G (October 2003). "Role of Angiopoietins and Tie receptor tyrosine kinases in angiogenesis and lymphangiogenesis". Cell and Tissue Research. 314 (1): 61–8. doi:10.1007/s00441-003-0749-6. PMID 12915980. ^ Haas TL, Milkiewicz M, Davis SJ, Zhou AL, Egginton S, Brown MD, Madri JA, Hudlicka O (October 2000). "Matrix metalloproteinase activity is required for activity-induced angiogenesis in rat skeletal muscle". American Journal of Physiology. Heart and Circulatory Physiology. 279 (4): H1540–7. doi:10.1152/ajpheart.2000.279.4.H1540. PMID 11009439. ^ Lobov IB, Renard RA, Papadopoulos N, Gale NW, Thurston G, Yancopoulos GD, Wiegand SJ (February 2007). "Delta-like ligand 4 (Dll4) is induced by VEGF as a negative regulator of angiogenic sprouting". Proceedings of the National Academy of Sciences of the United States of America. 104 (9): 3219–24. Bibcode:2007PNAS..104.3219L. doi:10.1073/pnas.0611206104. PMC 1805530. PMID 17296940. ^ Hellström M, Phng LK, Hofmann JJ, Wallgard E, Coultas L, Lindblom P, Alva J, Nilsson AK, Karlsson L, Gaiano N, Yoon K, Rossant J, Iruela-Arispe ML, Kalén M, Gerhardt H, Betsholtz C (February 2007). "Dll4 signalling through Notch1 regulates formation of tip cells during angiogenesis". Nature. 445 (7129): 776–80. Bibcode:2007Natur.445..776H. doi:10.1038/nature05571. PMID 17259973. ^ Soker S, Takashima S, Miao HQ, Neufeld G, Klagsbrun M (March 1998). "Neuropilin-1 is expressed by endothelial and tumor cells as an isoform-specific receptor for vascular endothelial growth factor". Cell. 92 (6): 735–45. doi:10.1016/s0092-8674(00)81402-6. PMID 9529250. ^ Herzog B, Pellet-Many C, Britton G, Hartzoulakis B, Zachary IC (August 2011). "VEGF binding to NRP1 is essential for VEGF stimulation of endothelial cell migration, complex formation between NRP1 and VEGFR2, and signaling via FAK Tyr407 phosphorylation". Molecular Biology of the Cell. 22 (15): 2766–76. doi:10.1091/mbc.E09-12-1061. PMC 3145551. PMID 21653826. ^ Ferrara N, Kerbel RS (December 2005). "Angiogenesis as a therapeutic target". Nature. 438 (7070): 967–74. Bibcode:2005Natur.438..967F. doi:10.1038/nature04483. PMID 16355214. ^ Folkman J, Klagsbrun M (January 1987). "Angiogenic factors". Science. 235 (4787): 442–7. Bibcode:1987Sci...235..442F. doi:10.1126/science.2432664. PMID 2432664. ^ Folkman J (September 1996). "Fighting cancer by attacking its blood supply". Scientific American. 275 (3): 150–4. Bibcode:1996SciAm.275c.150F. doi:10.1038/scientificamerican0996-150. PMID 8701285. ^ Stegmann TJ, Hoppert T, Schneider A, Gemeinhardt S, Köcher M, Ibing R, Strupp G (September 2000). "[Induction of myocardial neoangiogenesis by human growth factors. A new therapeutic approach in coronary heart disease]". Herz (in German). 25 (6): 589–99. doi:10.1007/PL00001972. PMID 11076317. ^ Folkman J (February 1998). "Angiogenic therapy of the human heart". Circulation. 97 (7): 628–9. doi:10.1161/01.CIR.97.7.628. PMID 9495294. ^ McDougall SR, Anderson AR, Chaplain MA (August 2006). "Mathematical modelling of dynamic adaptive tumour-induced angiogenesis: clinical implications and therapeutic targeting strategies". Journal of Theoretical Biology. 241 (3): 564–89. doi:10.1016/j.jtbi.2005.12.022. PMID 16487543. ^ Spill F, Guerrero P, Alarcon T, Maini PK, Byrne HM (February 2015). "Mesoscopic and continuum modelling of angiogenesis". Journal of Mathematical Biology. 70 (3): 485–532. arXiv:1401.5701. doi:10.1007/s00285-014-0771-1. PMC 5320864. PMID 24615007. ^ Gonzalez-Perez RR, Rueda BR (2013). Tumor angiogenesis regulators (first ed.). Boca Raton: Taylor & Francis. p. 347. ISBN 978-1-4665-8097-8. Retrieved 2 October 2014. ^ Nishida N, Yano H, Nishida T, Kamura T, Kojiro M (September 2006). "Angiogenesis in cancer". Vascular Health and Risk Management. 2 (3): 213–9. doi:10.2147/vhrm.2006.2.3.213. PMC 1993983. PMID 17326328. ^ Hariawala MD, Sellke FW (June 1997). "Angiogenesis and the heart: therapeutic implications". Journal of the Royal Society of Medicine. 90 (6): 307–11. doi:10.1177/014107689709000604. PMC 1296305. PMID 9227376. ^ Cao L, Mooney DJ (November 2007). "Spatiotemporal control over growth factor signaling for therapeutic neovascularization". Advanced Drug Delivery Reviews. 59 (13): 1340–50. doi:10.1016/j.addr.2007.08.012. PMC 2581871. PMID 17868951. ^ Rouwkema, Jeroen; Khademhosseini, Ali (September 2016). "Vascularization and Angiogenesis in Tissue Engineering: Beyond Creating Static Networks". Trends in Biotechnology. 34 (9): 733–745. doi:10.1016/j.tibtech.2016.03.002. PMID 27032730. ^ Amaral, Ronaldo Jose Farias Correa; Cavanagh, Brenton; O'Brien, Fergal Joseph; Kearney, Cathal John (16 December 2018). "Platelet‐derived growth factor stabilises vascularisation in collagen‐glycosaminoglycan scaffolds". Journal of Tissue Engineering and Regenerative Medicine. 13 (2): 261–273. doi:10.1002/term.2789. PMID 30554484. ^ Chia-Chi Chien, Ivan M. Kempson, Cheng Liang Wang et al, "Complete microscale profiling of tumor microangiogenesis" Biotechnology Advances (2011), doi:10.1016/j.biotechadv.2011.12.001. This page was last edited on 6 April 2019, at 10:31 (UTC).